KIEV, Ukraine -- Talks to end the crisis in Ukraine have begun in Kiev, brokered by international monitors, but pro-Russian rebels are not represented. The talks were being held in full view of the media. Ukraine's interim leaders and other public figures are at the talks, which are part of an OSCE roadmap plan. 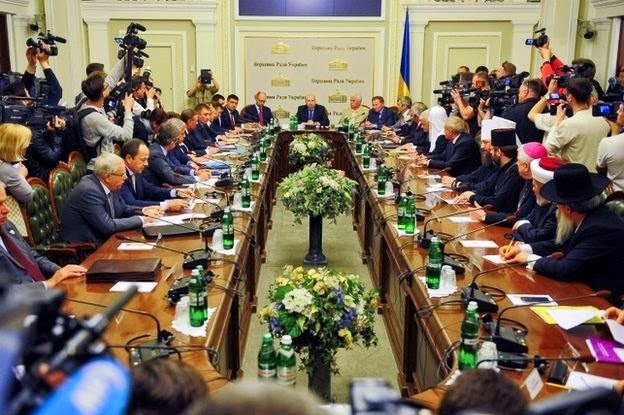 The "national unity round table" was meant to be as inclusive as possible. The interim government has said the annexation of Crimea by Russia this year cost Ukraine at least 1tn hryvnya (£49.3bn; $83bn; 60.5bn euros). A day earlier, Ukraine's military suffered its heaviest losses to the rebels so far in the fighting in the east, where rebels control a number of towns. Seven soldiers were killed when rebels ambushed an armoured personnel carrier near the town of Kramatorsk in Donetsk region, according to the defence ministry. One rebel is said to have also died. Donetsk and the neighbouring region of Luhansk have declared themselves separate from Ukraine after referendums deemed illegal by Kiev, the US and EU, but Russia said it "respected" the votes. The struggle for control of Ukraine, where the elected pro-Moscow president was deposed in February, has set Russia at loggerheads with Western powers. Russian Deputy Prime Minister Dmitry Rogozin told reporters he would not support a US and European proposal to extend the international space station beyond 2020 but the US space agency NASA, which relies on Russia to ferry astronauts to the station, said it had not yet received any official notification on changes in space co-operation. In Moscow, Sergei Naryshkin, the Speaker of the lower house of the Russian parliament, said the Ukrainian authorities' refusal to speak to separatists and their continuing military operation in the east would undermine the legitimacy of the presidential election on 25 May - but he called for it to go ahead. Russian troops moved to begin constructing a pipeline to supply Crimea with water weeks after Ukraine cut off supplies. The OSCE (Organisation for Security and Co-operation and Europe) - a security and rights monitoring group drawn from European and North American states - said Russian President Vladimir Putin supported its initiative. A veteran German diplomat, Wolfgang Ischinger, was brought in to moderate Wednesday's talks. Those present include interim President Olexander Turchynov, Prime Minister Arseniy Yatsenyuk and several former Ukrainian leaders. "Let's have a dialogue, let's discuss specific proposals," Mr Turchynov was quoted as saying by the Associated Press news agency. "But those armed people who are trying to wage a war on their own country, those who are with arms in their hands trying to dictate their will, or rather the will of another country, we will use legal procedures against them and they will face justice." The interim government has refused to talk to the separatists, who apparently lack a single leader and agreed goals, in any case. "The government in Kiev does not want to listen to the people of Donetsk," Denis Patkovski, a member of a pro-Russian militia in Sloviansk, Donetsk region, told AP. "They just come here with their guns." German Foreign Minister Frank-Walter Steinmeier, currently visiting Ukraine, said he hoped that Wednesday's talks would lead to the separatists disarming and would also improve the atmosphere for the presidential election. German Chancellor Angela Merkel, speaking in Berlin, said the more representative the talks were, the better. But she added: "Clearly, people are only welcome if they can credibly show that they are prepared to reach their goals without violence." Armed separatists continue to occupy key government buildings in the east while Russia denies fomenting the unrest just over its border. NATO states some 40,000 Russian troops are deployed near Ukraine's border, although Moscow says they have been pulled back. Russia annexed Ukraine's southern autonomous republic of Crimea in March following a controversial referendum and the Ukrainian interim government fears a similar outcome in Donetsk, Luhansk and parts of the south.